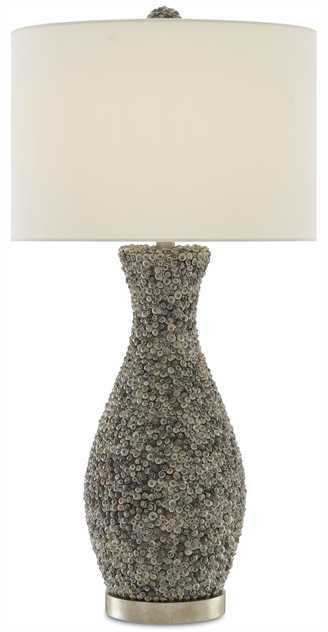 The Batad Shell table lamp is covered in a symphony of tiny shells of the same name, the conical shapes with their fluted openings adding textural interest to the curvy shape of this decorative lamp. Their pearlized exteriors create a subtle interplay of light and dark along the fixture's surface. Though these tiny shells, which have been painstakingly applied to a terracotta body, are quintessentially nautical, the effect they achieve as a finish will fit perfectly within a room decorated in any number of stylistic notes. Takes one 150 watt max bulb (not included). SHADES: Off White Shantung, 16" x 17" x 11"